Adhesive manufacture represents an $18 billion a year global industry. The market for adhesive products spans a diverse range of industries including: electrical and electronic systems, packaging, consumer goods, medical and dental products, construction and building materials, industrial assemblies, paper, and transportation. The primary categories of adhesives are: hot-melt, pressure-sensitive, protein-based, radiation-curable, heat-sealing, heat-activated, rubber-based, thermoplastic, thermosetting, solventborne, and waterborne. 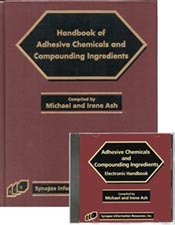 The Handbook of Adhesive Chemicals And Compounding Ingredients describes the raw materials that are used to manufacture the variety of adhesives that meet end user requirements. This reference includes information on the following types of chemicals and materials: Accelerating agents; Adhesion promoters, Antiblocking agents; Antioxidants; Antimicrobials, Antisag agents, Antitack agents; Bases; Bleaches; Catalysts; Colloidal stabilizers; Crosslinking agents; Defoamers; Curing agents, Dispersants; Dyes; Extenders; Fillers; Film-formers, Flame retardants, Gloss agents, Hardeners, Humectants; Insolubilizers; Liquefiers; Pigments; Polymers, Plasticizers; Preservatives; Processing aids; Reinforcing agents, Resins, Rosins, Softeners; Solvents; Stabilizers, Tackifiers; Thickeners/Viscosity control agents; UV absorbers; Vulcanizing agents; Waxes, Waterproofing agents; Wetting agents. The selection of raw materials for a specific adhesive product is a complex process that includes evaluation of essential factors such as: adhesive type, materials to be joined (e.g., texture of substrates), processing factors, requirements for product construction, expected usage, cost constraints, end-use environmental conditions (UV light, solvents, temperature), and regulatory constraints. The reference is organized so that the reader can access the information on adhesive ingredients based on the trade name, chemical components, functions and application areas, manufacturer, CAS number, and EINECS/ELINCS number. This section provides an alphabetical listing of more than 7300 trade name chemicals and materials that are used in adhesive products. Each entry includes the manufacturer's name; chemical/material description; its detailed functions and applications in all aspects of industry; physical properties, such as form, molecular weight, density, solubility, boiling point, cloud point, flash point, pH, freezing point, activity; toxicology, storage, precautions, etc. This section covers more than 2200 chemicals and materials that are contained in the trade name products profiled in Part I or generic chemicals that are not linked to trade names but are used in the formulation of adhesives. Each entry contains information including the following: CAS, EINECS/ELINCS, and UN/DOT numbers, classification, definition, synonyms, formulas, properties, toxicology, precautions, storage, uses, use level, regulatory details, manufacturers and distributors. Chemical/material synonyms are cross-referenced back to the main entry. Entries are followed by a listing of the trade name products that are either equivalent to the monograph entry or contain it as one or more of its ingredients. Manufacturing and distribution sources for the generic chemical are also included. Powerful tool for locating the trade names and chemicals based on their function and/or industrial application area. By searching for key functional words combined with a specific application area the user is directed to the trade names and/or chemicals that have that specific functional/application attribute. FDA Regulatory Number Index contains the trade names and chemicals that have been approved as adhesive ingredients for articles intended for use in packaging, transporting, or holding food.